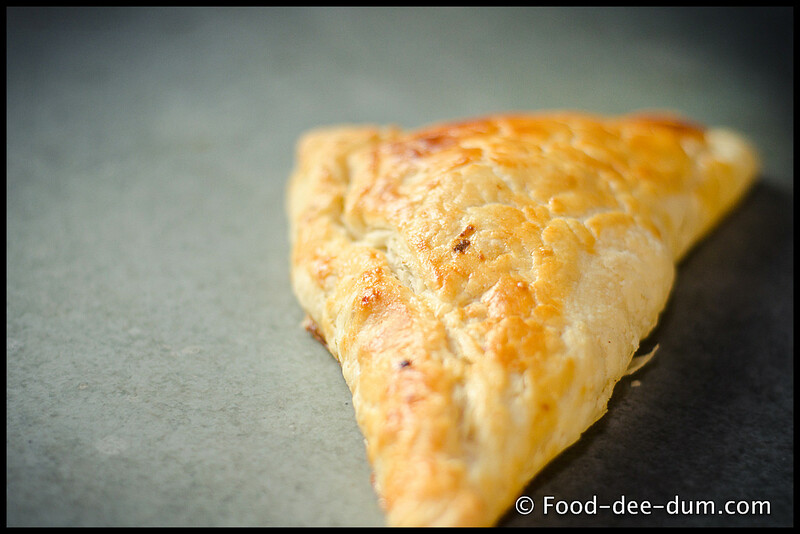 I may have mentioned that patties (flaky pastry stuffed with filling) is AK’s absolute favourite snack. Irrespective of the surroundings, he never ever gives up a chance to try patties at coffee shops, street stalls, college & office canteens and any other place he spots them. His biggest beef with some of them is that they re-heat the patties in a microwave rather than oven/ food-warmer/ hot-case/ toaster. The microwave makes it chewy & rubbery and anything but flaky! I had been promising to experiment with patties for a while, but I had always thought making any kind of pastry was a big headache. So I finally got up the enthusiasm to try. And I haven’t changed my mind completely – it is effort intensive, but not difficult. And the result is well worth the effort! Actually, it almost over-compensates! I also made some apricot & cashew ones for dessert. The pastry recipe is from BBC Good Food and the fillings are my own! Shredded Curried Chicken (I had leftovers from dinner — a dry boneless chicken dish with the chicken marinated in salt, garlic, curry powder/ Sambhar powder and cooked on high heat for about 15-20 mins.) You can use any other version of cooked chicken in any flavour/ seasoning you may like. First, I mixed the flour & salt in a mixing bowl. Yes, I know my hand looks all kinds of creepy in this pic! Anyhow, I then added iced water in small batches while kneading to make a soft dough. In simpler words, took a little water in my upturned/ cupped hand and then added to the flour-butter mix and kneaded. I kept repeating till the dough came together. Once it came together, I knead it with the back of my fist – punch, spread it out, pull it back together & repeat. I don’t think I know the science behind that, but it’s what I’ve been taught to do when kneading any dough! I mixed the yellow butter with the remaining white butter in a bowl and then generously floured my counter-top. I then slapped (trying to be emphatic here!) the dough onto the surface and, using my rolling pin, rolled it out into a rectangle, approximately 5″ x 10″ in size. Bear in mind that you will need to flour the surface, the rolling pin and the top part of the dough continuously to avoid sticking and tearing of the dough. OK now here’s where my amateur diagram comes into use – it’s a simple technique that I’m going to christen The Rule of 3rds!Read & re-read till it’s clear because the key lies in this technique, simple as it is! And it needs to be repeated a few times in this recipe. In the rectangle of dough, mentally divide (or make light markings – not cuts – with a knife to guide you) into 3 parts along the longer size. The yellow patch indicates the 2/3 of the dough which needs to be dotted with part of the fat (the 2 combined butters). After which part 1 is folded over part 2. Then part 3 is folded over the centre (where 1 & 2 are already layered). Then I carefully folded over the unbuttered panel onto the centre. If you haven’t floured the dough & surface generously, here is when the dough might stick to the surface and tear. Here’s what it looked like, all pinched and bundled up!! Sealed and chilled it for 15 mins. Then repeat with the balance butter and chill another 15 mins. Then folded it the same way one last time without any butter and chilled it for 30 mins. This waiting and folding and chilling and waiting some more is really enough to try the patience of a saint. Maybe pastry chefs are a level above saints. Hmmm. Anyhow, if the folding makes it bulky and difficult, feel free tp flour and roll it out to be thinner in-between the chilling-buttering-folding routine. I definitely did because after the second time, it became difficult to fold. During the final chilling session, I turned on my oven to about 200 C. I prepared a baking sheet/ cookie tray by lining it with butter paper and spraying a fine layer of cooking oil (Pam). You can just rub some oil on it. I made some egg-wash: 1 egg with about 2 tbsp of cream. You can use milk or water too. And no, the sweet & savoury fillings did not go in together! After flouring it generously, I used my pizza cutter to divide the dough into 8 equal parts… Or as close to equal as I could manage! So this step is something that requires experimentation and practice. I can’t make it any easier. In fact I also experimented between the triangle & rectangular shapes. Even though the triangle looks better, the rectangle is easier. And the amount of filling to stuff in without tearing the dough is also a matter of practice & experience. I got 5 chicken patties and 3 apricot-cashew patties out of this quantity… Variance in the size and fillings would give a different yield. Finally, I baked them for about 30 minutes in the oven, until they were a nice golden brown colour and all puffed up! I had to turn on the top heat for the last 5 minutes to even out the colouring & crispness. Delicious. Totally worth the effort, including the roll-butter-chill-repeat routine! But I will need some serious motivation and nudging to do it again soon! My savoury filling wasn’t chopped fine. For these patties, small diced (or minced) filling is preferable to chunkier filling. Makes it easier to handle while making and also easier to eat. Very versatile use of the flaky pastry is possible. You can fill them with anything – make them individual serve size or bite-sized. They can be open top or closed pie style. Sweet or savoury. The possibilities are endless, and I love that! !